The lecture will be given on August 28 between 2 – 3 PM and is called “Japanse warenhuizen en de cadeaucultuur” – Japanese department stores and the culture of giving. The lecture will be in Dutch. In the early decades of the 20th century, the first big department stores opened in Japan, based on the so-called ‘Grands Magasins’ of Paris, London, Philadelphia and New York. In that time, large department stores were the summum of modernity with their lavish product presentations and technical innovations like elevators and escalators. 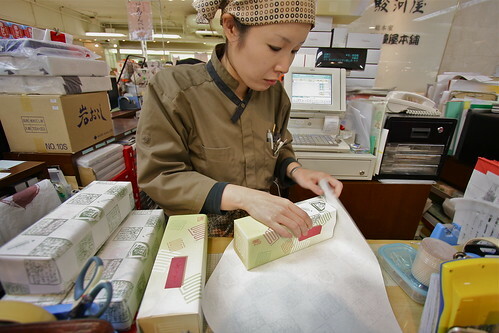 However, nowadays, Japanese department stores are presenting themselves as guardians of Japanese traditions, a point stressed by the importance put on formal gift giving. In this lecture, Prof. Cwiertka will talk on how this change has taken place. Attending lecture is free after entering the SieboldHuis museum. Please register through the following link: Japanse warenhuizen en de cadeaucultuur.